Ok so the “hot” thing right now is watercolor. I took a class a month or so back and have just begun to get ready to play. I found a great video on Youtube by AmyR and she showed how she organized her Peerless Watercolors. So I got to work on doing this so that I will use them. 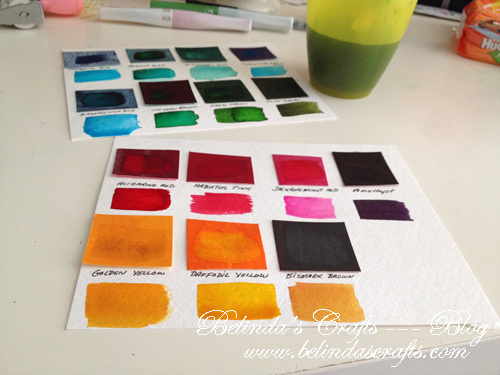 The one I have is Nicholson’s Peerless Transparent Watercolors Joanne Palette Colors which contains 15 sheets. So I put on some rubber gloves. A good thing to use because it gets messy from the moisture in your fingers. 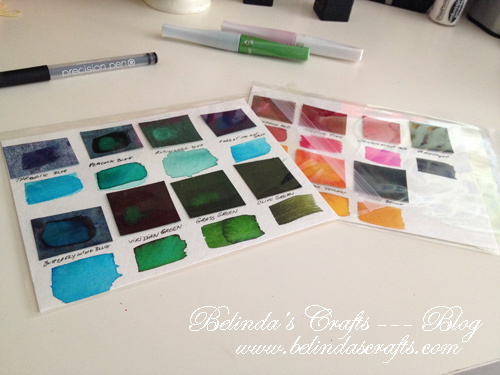 If you haven’t use these before, they are paper that when you wet them they create watercolors. They tend to last much longer than you think so I cut small squares from each sheet. Then I attached them to my Strathmore 140lb watercolor paper which was cut down to about 41/2 x 5 1/2 so that I could slip them into my clear bags that are 5 7/8 x 7 3/4. I left space at the top incase I want to attach a ring to hold them. I am not sure yet. I adhered them down with my ATG and then realized in all of the excitement, that I glued them upside down. AAhhhh!!! So I had to redo it and then I wrote the names of the colors below each swatch and got to work with brush and water and placed a swatch below so that I could see the true colors. After they dried I slipped them into the clear bags. 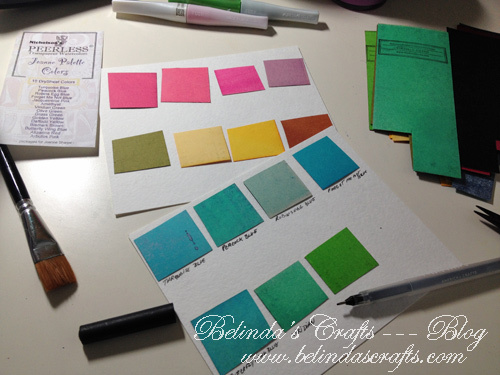 Now I can pick it up and see exactly what the colors are and match them to my pattern papers. I think I will actually use them now.